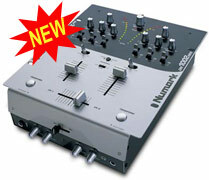 Replacement Crossfaders available for Numark mixers from $58. The great value for money entry level mixer. The dm1050 from numark is a cool starter mixer packed with loads of features that make it perfect for beginner djs who like to take things seriously. 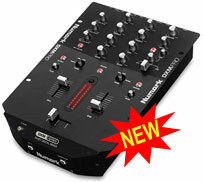 The DM950USB is an affordable two- channel mixer with two USB audio ports built into the mixer. USB technology allows audio files to be transferred to and from your computer. Mix your computers music files with vinyl, CD, DVD or a microphone. Incorporate MP3, WMA, WAV, and other digital music files in the mix from any USB-equipped PC or Mac. The DM1002 MKII supports two line inputs, two switchable phono/line inputs, and one 1/4" microphone input, as well as master and record outputs. The DM1002 MKII has a replaceable crossfader with reverse and slope control, and two transform buttons. Additional updates include slider-style cuing, theft-proof knobs, and a dual-tone, tapered design. The DM1002 MKII keeps the signature multi-colored, curved LED meters of the original model for master and PFL metering. The DM2050 is a compact, 3-channel tabletop mixer designed for today’s turntablist, desktop, and aspiring DJ. Featuring steep 3-band EQ on every channel, a replaceable crossfader with reverse and slope control, a dedicated microphone input with 2-band EQ, and multiple input sources, this entry-level mixer is big on features and easy on the wallet. 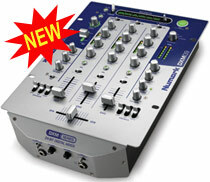 DXM01-USB The Worlds first DJ mixer with USB!! 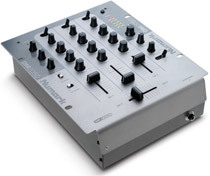 The DXM01 USB is a 24-bit digital DJ mixer with a 10” tabletop design that includes two USB ports for direct computer connectivity. Audio files can be played from computer and mixed along with records, CDs, and microphone. Mixes can also be recorded back to computer via USB. No software drivers are needed with Windows XP or Mac OS X, and a USB cable is included. With a 24-bit digital signal path throughout, the DXM01 USB offers the purest sound of any DJ mixer, all digital controls, and sub-bass synthesis with intensity control. Make a filter pulse to the groove. Fade in tape echo that hits the beat perfectly. Give a shout-out through the vocoder. The DXM06 features 12 DSP effects—all certified for total DJ vibe enhancement. Work the Beat Sync Tap Button, wet/dry fader, parameter knob, and illuminated FX selector. For DJ effects that inspire like no others, mix with the DXM06. All the amazing digital features of the DXM01 plus more flashing lights and even more effects! 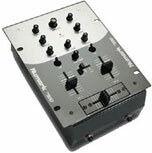 The DXM09 is a digital 3-Channel DJ mixer with effects. The 100% digital circuitry provides the lowest noise floor available. Built-in look-ahead peak limiting prevents clipping and ensures the cleanest output signal at all times. The on-board effects section gives the DJ “on-the-fly” control over multiple effect parameters such as rate, beat sync, and mix intensity.The DXM09 offers the cleanest audio signal and the most creative options available in a tabletop mixer. 8 Line, 3 phono, 2 mic inputs. 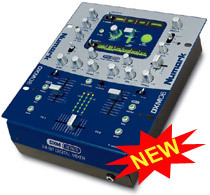 The "1090" is a compact high-quality mixer at an excellent price. 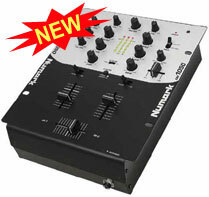 This mixer is perfect for the DJ that may be tight on space but needs to control their environment. With inputs for 3 turntables, 3 lines and 2 mics you get alot to work with. The 1090 has a 5-band equalizer with bypass to allow excellent frequency output control. With the booth output you can control a monitor speaker or another room. The CM200USB includes two USB audio devices built into the mixer allowing the user to utilizing their computer music files without the need of drivers or sound cards. Two USB ports are included so you can take advantage of the multiple sound card feature found in most DJ mixing software. You can also record your mix at the same time as play back (full duplex). 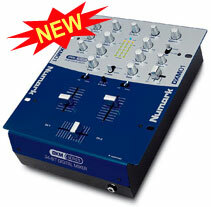 The 100% digital DXM Pro incorporates world-class fader technology into the ultimate 2-channel scratch mixer. 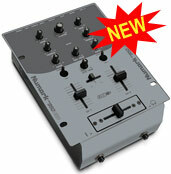 It is the perfect professional performance scratch/battle DJ mixer. It also incorporates a unique spring-loaded transform function built into the phono/line switch for professional competitors. The design is sleek, clean and rugged and presents a rock-solid battle mixer. 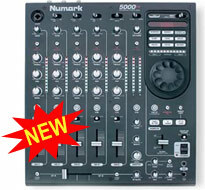 The Numark 5000FX is a 5-channel tabletop DJ mixer with integrated sampling, scratching, and effects. There are 3 phono, 9 line (3 switchable to phono), and 2 mic inputs—including a top-mounted Neutrik jack. Outputs include XLR balanced and RCA unbalanced master, zone, booth, record, and S/PDIF digital. Additional features include dual BPM meters, fader start, and a replaceable crossfader with adjustable slope.